Slate: Starting with some of those new things, I’d like to start with these new versions of Link and Zelda, both from the way they look to the role that they play in the game. They’re quite a bit different from what we’ve seen before, and I was hoping to find out where those ideas came from for them this time and what the goals were with these characters. Fujibayashi: As for Link, we wanted to make Link look a lot cooler in design than Skyward Sword. But also we wanted everybody to be able to relate to Link, to be able to like him no matter what kind of forum. So, we designed him that way. As for Zelda, we kind of portrayed her more like a sister-like figure, not necessarily in age, but just kind of as a woman that’s a little bit older or mature. Aonuma: Actually, I think the first time we really solidified the Link design for this title, or we started to solidify it, was when we first showed a trailer for the then-not-yet-titled Breath of the Wild; it was just a new Zelda game. But you had that moment where he’s facing off against the Guardian, and he jumps off the horse, and he pulls the arrow back and shoots it. And he has an expression on his face that’s kind of troubled; it’s kind of sad. We initially were going to have him have more of a triumphant look on his face, and we thought that really doesn’t fit this Link. He should look more kind of consternated (filled with anxiety), I suppose. When we figured out that, “Oh, that’s the face he has to have,” a lot of other things for this Link, and his design, and who he should be really started to fall into place. Fujibayashi: Link is not just a character that portrays justice, but we also wanted to incorporate that he has history in the past, he has something of a dark side to him. So we didn’t want to just portray him as a go-getter. We wanted to have him have kind of a secretive past. Slate: And so did all of that, the idea of the tragic past, and what happened 100 years ago, and that extra weight on Link’s shoulders really come about from the work that was done on that original teaser trailer? Aonuma: In terms of the specific story beats and the setting, we had had that planned and figured out then. It was more a matter of, since he has that in his background, how do we need to make him look? So it was more the setting influencing his design. At that time, we already had the story beats and the story ideas of Link being someone who’s waking up from the past, doesn’t know who he is. And coupled with that, having him be someone who is this kind of go-getter who’s thinking, “Oh yeah! Let’s go do this. Let’s get this taken care of,” wouldn’t really fit with that background and that story idea. So, it was really the relationship of the story beats and the story ideas we already had with his design that ended up influencing the design, and we ended up with the Link that we have. But what do you guys think? 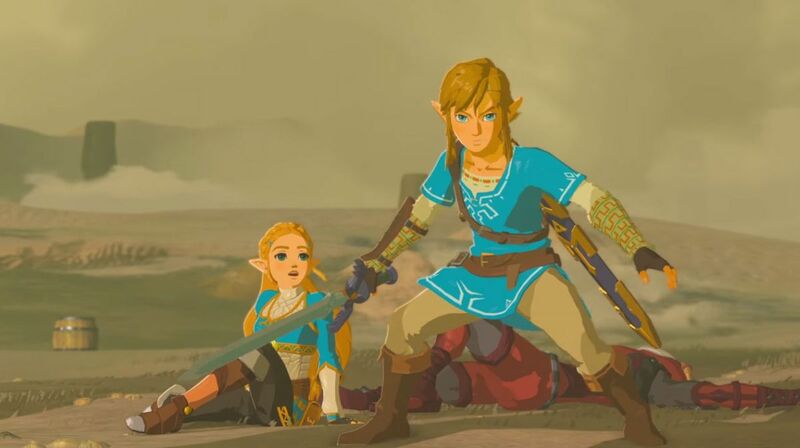 Did you like Breath of the Wild‘s versions of Link and Zelda or would you have liked to see them in a more traditional version? Let us know in the comments below!